Phosphatidyl Serine / PS - 100 mg, 60 softgels each (Nature's Wonderland) - Penn Herb Co. Ltd. Maintain your mental edge in today's competitive work and school environment. 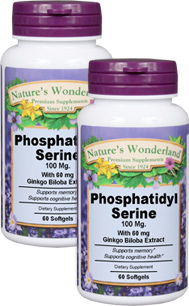 Stay mentally sharp and focused with the proven brain boosters, Phosphatidyl Serine & Ginkgo. These "brain foods" promote healthy mental & cognitive function. PS is a naturally occurring compound derived from Soy Lecithin. It supports the activity of brain neurotransmitters involved in learning, memory and mood. Ginkgo, the well-known brain and circulatory tonic supports cognitive function and improves mental clarity. Together, they give you edge you need to operate at your best! As a dietary supplement, take 1 softgel 1-3 times daily with or between meals. CONSULT PHYSICIAN BEFORE CONSUMPTION IF YOU ARE CURRENTLY TAKING ANTI-COAGULANT OR MAO INHIBITIVE DRUGS.